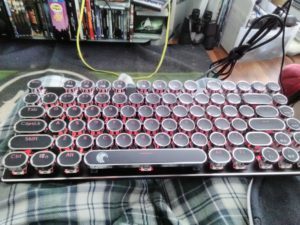 Today I received my new keyboard which my girlfriend bought me! In an effort to do more writing I am hoping this will promote more of these at a regular/semi regular basis. Recently I have been attempting to catch up on some cataloging of some of my possessions. Comic books, Mortal Kombat stuff, just things around that house I want to keep a record of just to help me sleep. I tend to over think everything so being safe about pretty much everything I do kinda is my thing. Tomorrow I will be having my landlord come over for a home inspection. They check to make sure our fire equipment is up to date, make sure nothing is out of order and so on. Sign a new Lease for another year and do all that “Adulting” stuff that needs to be done. Really the months are flying by pretty fast and as I have said in the past the older I get the faster it seems to go. I often have to think about what my life will be like in another 20 years if it will just go by like seconds. Perhaps having children will make it slow down but somehow I think I am kidding myself if that’s really the truth to it all. I think having to be so busy will just make it all go by far faster… but who knows.. we will see once I get to that point. Right now the weather is cold but I think it’s about to get much warmer very soon. We had an interesting snow fall weekend and something in my bones tells me it was the last of it. I can’t believe it’s MARCH!! In the last year or so my mind has changed focus. I am not sure if it was any one thing or just the way events have panned out but I do feel a change. Both menatally and physically overall. I never gave much thought to my future short of my interest, work, my writing here, and my family/friends. With age comes an interesting prospective on placement in the universe. The feeling of immortality is long gone and I know now that tomorrow will be different. I find it funny that I write at all. I hated learning it and never showed any interest in reading. Not till my 20s did I start to use the voices in my head to make any of it fun. Now I couldn’t go a week without writing something if it be here or elsewhere. Time will tell what mark i make but I have to beileve it’s all for something. Let me start this off by saying that this is my place for thinking and observing. Everything I write here is opinion and I in no way wish for anyone to do anything at all. I simply want to speak my mind. With that said I have done 171 Observations over the year. Some short, some long, and most of the time I try to make a point with this. I am not a great writer but the point of this all was to work on a skill I otherwise never paid any attention with. I enjoy many things in my life writing being just one of em. What I have come to observe lately has been a kinda sad lot of things. In a massive wave of perhaps ignorance many people “Not all but MANY” seem to think that the problems in the current situations they are placed in are someone else doing. To that I say NO! I learned a very very long time ago that every problem I have or that is presented to me has and always will be MY OWN. I put myself into said situation and I ALWAYS have control over the highs and lows of it. Sure I watch as people get into scenarios that find themselves losing control but let’s not play the game of HOW DID I END UP LIKE THIS? Clearly a decision was made at some point BY YOU that put you into that situation. Now of course as an adult I have also come to terms with just accepting that somethings in this world I won’t have control over and yes it will probably effect me in the long term as it might not effect me in the short. Personally I have always been a long term thinker. I almost never put myself into a situation that I don’t think about the LONG TERM effects. Personally I like to keep everything in a worse case scenario situation mindset all the time. It tends to almost never turn out that way but the advantage to that is you are always happy with the outcome cause it’s never that bad. For instance walking to work is about a 8 minute walk from home. It’s normally not day time so naturally my mind can come up with some pretty funny and horrible situations that could happen during those 8 minutes. I could get hit by a car, abducted by aliens or someone could run up to me with a cupcake and just make my entire night great! Like I said.. I tend to keep my mind in that mindset because it works out for the best most of the time. I have also found that is the best way to live a very very RICH life. Rich is defined as wealthy for the most part and I know for a fact I AM VERY Wealthy for whom I am and with what I have. I have everything I have ever wanted because I worked for it. I have never made a decision that I regretted HOWEVER..I have at times been hard on myself for making some decisions which isn’t the same as regret. Maybe some day I will explain that but not today. People really need to look around at what is happening around them and understand that IT’S THE DECISIONS YOU ARE MAKING THAT MAKE THINGS HAPPEN. A side from this and really what the point is that I am making here is that I give credit to those who do good things and blame to those who deserve it. I am very unforgiving and it’s not because of how I feel but because I look over the facts. I often try to keep my emotions towards things at a minimum because I understand what harm that can do.